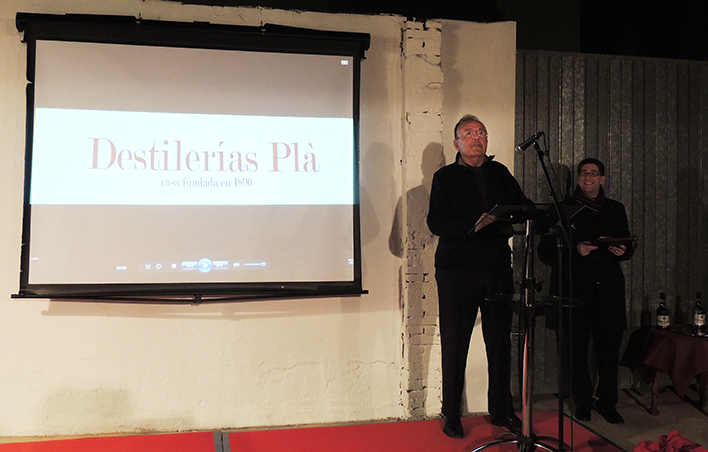 A night full of emotions that experienced the December 11, 2014 on the premises of Destilerías Plà. You together with friends and also of authorities, headed by the Minister of Interior and Justice, Luis Santamaria, the Pla family celebrated the 125th anniversary of the company. Destilerías Plà had decorated for such an important occasion. Everything had a special glow. The courtyard, the wine cellar and shop, and also the stars of the night; José Mateu Mateu Plà and José Ripoll, third and fourth generation of the company who were responsible for greeting guests go one by one to the gates of the distillery. Going along the courtyard reached the stage where the central part of the event took place. The most emotional moment was on stage with the rise of José Mateu Plà, who represents the third generation of the family. In his speech full of familiar landmarks wanted to pay homage to his grandfather and company founder, Joseph Pla, better known in Puçol as Uncle Pepe Plà. “Thanks to him we are here tonight. He built this company from nothing, for where we are now was a field of vines. Then my father, Rafael Mateu that led to the distillery to his years of splendor arrived. Tonight for me is a great pleasure to welcome you and celebrate with you a date as important as they are the 125th anniversary of the distillery “. Then it was his turn to speak to the current manager of the company and the fourth generation of the family, Jose Ripoll Mateu. Visibly moved, he wanted to thank all participants and would urge them to another 125 years, with the assurance that the company will continue living. The Mayor of Puçol, Merche Sanchis said linking Distilleries with Puçol. “This company is a living memory of our village, all of us here know it forever. It is above all a reference of our holidays when every year the festive visit in the September 7 “. 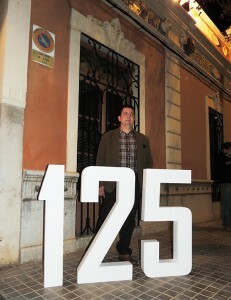 José Ripoll Mateu, current manager poses for the 125 years of Destilerías Plà. The event was also unveiled the outlines of what will be the next years of the company. Always working from a traditional way of working, Destilerías Plà wants to open the future through new media. Presence in social networks and new online store are necessary to open new markets for the Distillery. Finished parliaments, Plà toured with the authorities the facilities of the company and explained how the day-to-day work is. All attendees learned about such as 100% hand craftsmanship that is held in the mouth of his company employees who only have two machines (Capper and “the machine to fill in the bottles) that are not used for all products are bottled and then some also plug manually. Thereupon all present enjoyed a cocktail in the Plà products were the protagonists. In addition to the Minister of Interior, the ceremony was also attended by the Regional Secretary for Agriculture, Fisheries, Food and Water, Mr. Alfredo Gonzalez Prieto, Director General of Planning and Services of the Ministry of Economy, Miguel Angel Moline, Deputy regional, Enrique Ovejero and some of the mayors of the region as Jose Manuel Peralta of La Pobla Farnals, Adrian Carsí of Alfara del Patriarca and Joaquín Soler of Massalfassar plus all the Puçol Municipal Corporation and representatives of associations and groups in the municipality of Puçol.